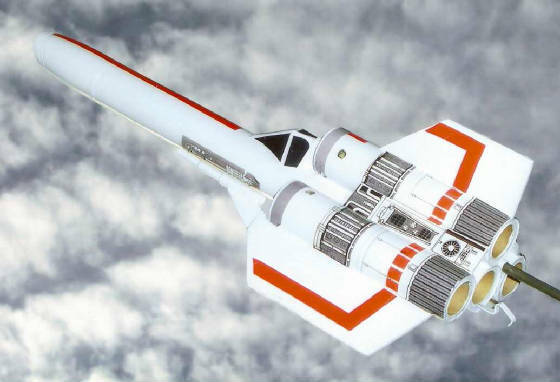 The MK II Colonial Viper is a Battlestar's primary tactical weapon. As a single seat fighter / interceptor, the Viper performs a dual combat role capable of operating both in planetary atmospheres and the vacuum of space. Recon Viper I was the first modified version of the MK II series. By removing the weapons systems and adding a second set of turbos, it had double the speed and range of the standard MK II Viper fighter. The Viper Blackbird is designed as a stealth spacecraft. Constructed from hybrid composite materials capable of absorbing dradis (radar) this version would be invisible to all modes of electronic detection. In the darkness of space it's flat black skin would guarantee this Viper a first look, first shot, first kill. Hyper Viper 4 Engine Cluster. 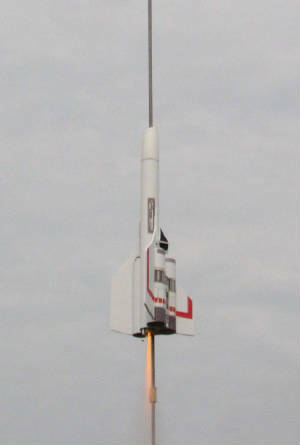 Launch photos below. 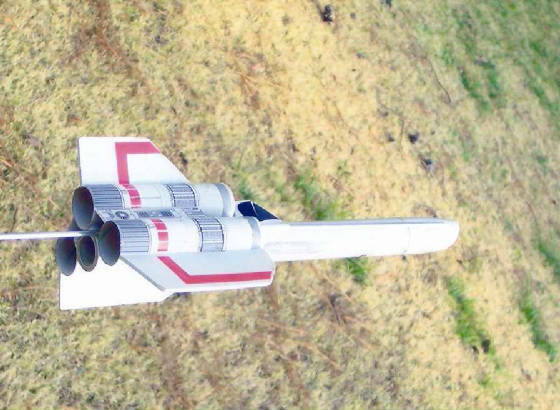 To scratch build the standard single engine version of the BSG Viper Estes kit #1310, go to the JimZ site at http://www.spacemodeling.org/JimZ/est1310.htm and download a complete set of instructions and parts list. You will be able to gather most of the parts needed at any good hobby shop or online vendor. There are a couple of items you will need to special order that are listed below. The information that follows is a list of several things you will want to know before you start your build. Be aware that you will need 0.6 ozs. 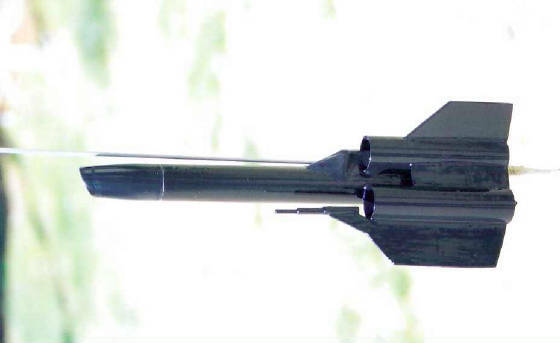 of additional weight for the nose cone. *Note: Fully prepped the single engine Viper weighs in at 3.4 ozs. ***Fly the single engine Viper on a B6-4 or a C6-5 engine. http://www.semroc.com/Store/Scripts/ClassicParts.asp?ID=154 and you can even place your order right there! 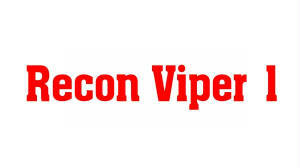 Viper decals are available from Tom Prestia at Tango Papa: http://www.tangopapadecals.com/ The decals come 2 sets per sheet. 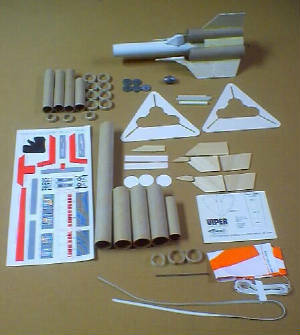 Above: Parts from the standard Estes Viper kit spread on the work table. In the top left corner you can see the extra parts for 3 more engine mounts for the Hyper Viper. Above: Red Squadron in various stages of construction. 3.1 oz. 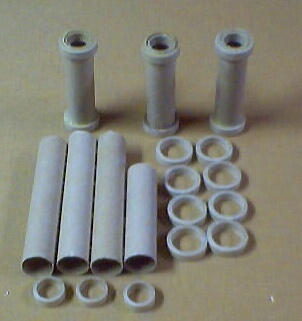 additional weight - clay / lead, or combination. 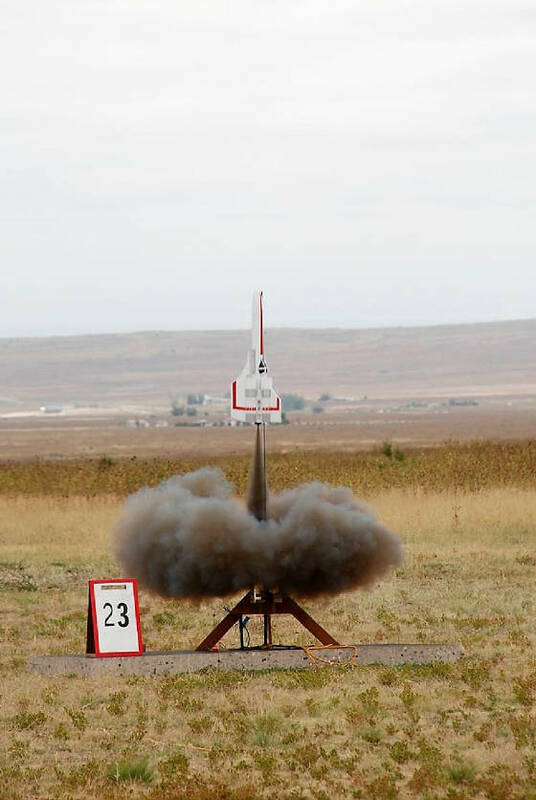 *Note to fly on 4 motors total nose cone weight needed is 3.4 ozs. 1. 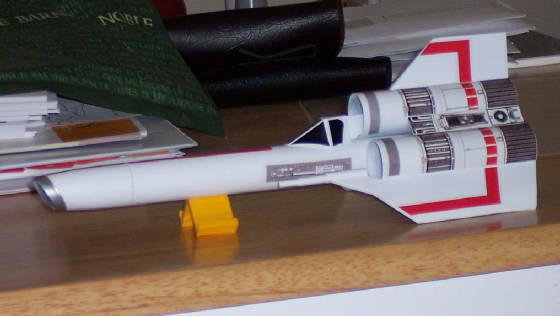 Build a single engine Viper per instructions of the standard Estes kit #1310. 2. Using the 24 mm engine mounts as a guide, make 3 solid disks by tracing the outside outlines of the 24mm engine mounts on scrap balsa or heavy paper. They will be used to keep the burn through of the booster engines from scorching the fuselage. 3. Install the disks 1/4" from the front of all 3 BT 50 tubes. When they are set, coat the internal side of the disks with a small amount of wood glue or ca. I do both. This will help prevent the burn through of the engines from eroding the discs. Mounting them in this manner will create a 1/2" x 50mm chamber from the end of the engine mount to the backside of the disks. 4. Drill 2, 1/4" holes in each engine tube on opposite sides, 1/2" from the front of BT 50 tubes. This will help vent the gases. You will have a total of 6 vent holes when finished. 5. Using the BT 20 tubes, engine blocks and mounting rings, construct 3 additional 18mm engine mounts. 6. When glue is set, install engine mounts into all 3 BT 50 tubes. Be careful to make sure you install the engine block end, first. It's easy to do it backwards. Make sure the rear of the engine mounts are flush with the rear of the BT 50 tubes. 7. Upgrade to a 3/16ths launch lug and 18" chute. 8. Paint with gloss paint. The decals will slide easier and adhere better to a gloss finish. If you want a flat finish, use dull coat after the decals are applied. 9. Install decals. Be aware that since there is a slight difference in the tube sizes from the original BT 52S and the BT 52 tubes you will be using, the decals that are to be used for the turbo tubes are slightly larger than the scale of the scratch built Viper. You will need to test fit them after they are cut from the decal sheet but before you attempt to apply. Trim to fit as needed. There is only a slight difference but enough to cause them to be mis-aligned if you don't make allowance for the differences. Fully prepped the Hyper Viper weighs in at 7.6 ozs. 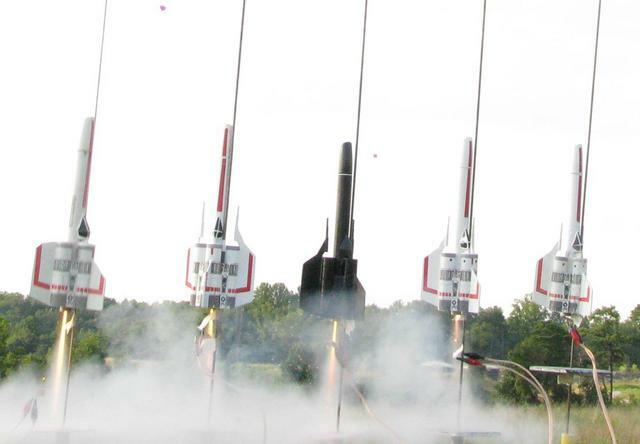 vernarockets@hotmail.com We will be happy to assist you. ***Fly the Hyper Viper on 3 B6-0 and 1 B6-6. OR 3C6-0 and 1 C6-7. 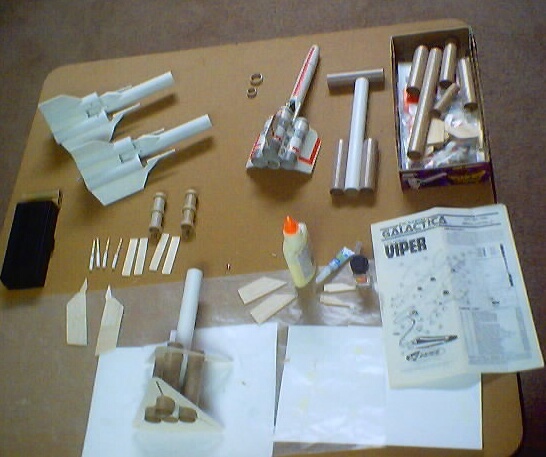 Above: The parts laying down, become the extra engine mounts standing up and go in the Hyper Viper. 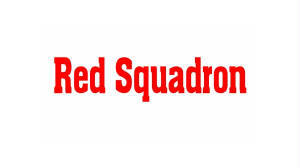 The construction of Red Squadron would not have been possible without the collaboration of several people and websites. Our thanks to JimZ for the instructions and parts list. 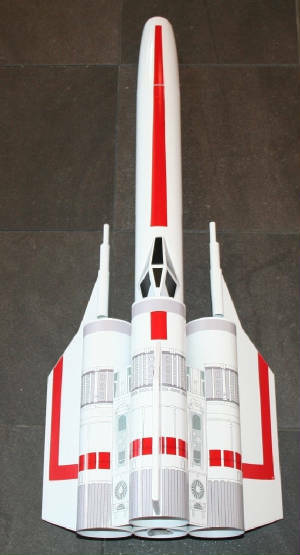 The JimZ website has instructions for almost every Centuri and Estes rocket kit ever produced. 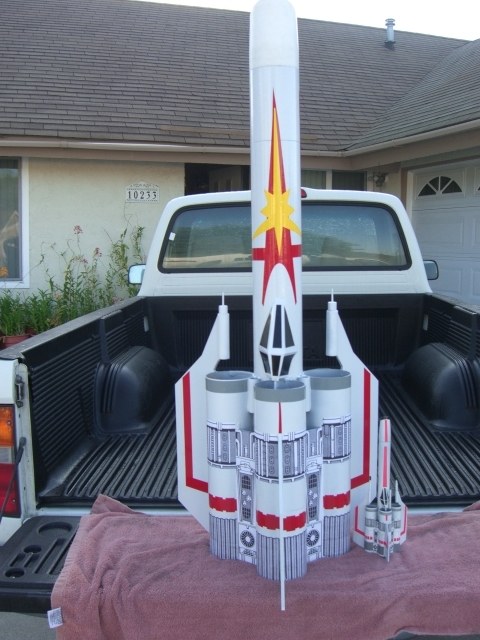 Tom Prestia at Tango Papa has done several custom orders for us including decals for Space Man Spiff's Rocket of Death, Rocket Babe, Bad Girl and Dorothy. We believe Tom's products are superior and his Viper decals are excellent! 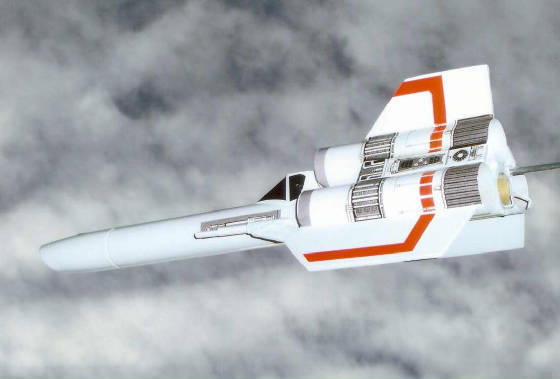 Sirius' cloned nose cones are higher quality and more substantial than the original kit nose cones. The original Estes cones weigh 0.1 oz., the thicker walls of the new cloned cones bump the weight to 0.3 ozs. 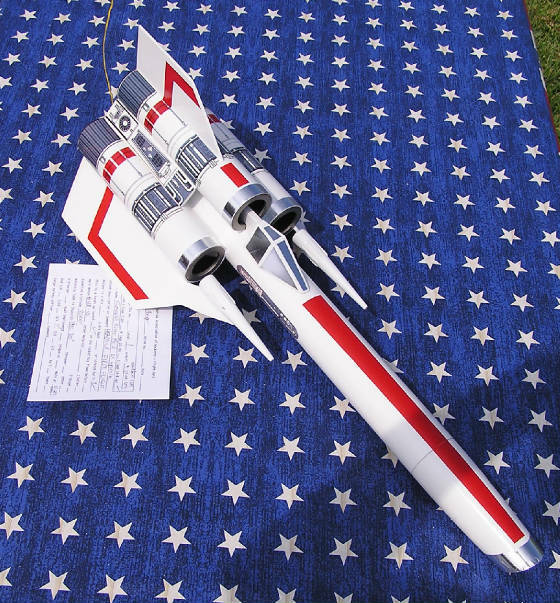 And finally, thanks to Brian Swanson at BRS Hobbies http://www.brshobbies.com/ for supplying most of our parts and even doing custom tube cuts at no additional cost. 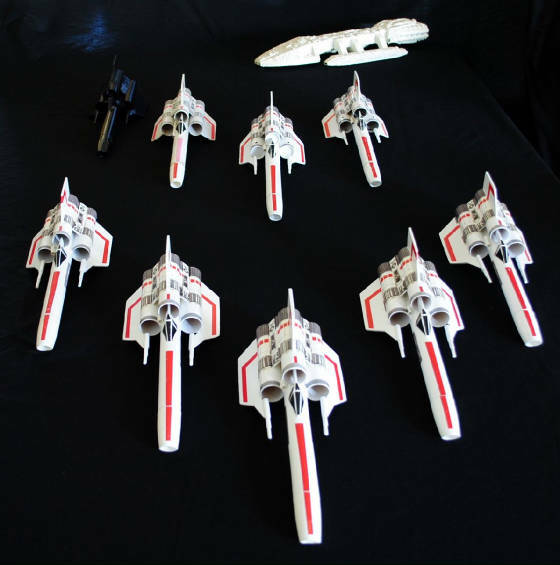 If you decide to build your own Viper please remember these vendors and don't forget to send us your photos. We would like to post them here. 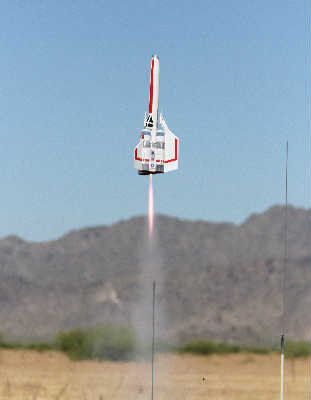 On March 18 we were finally able to have our first flights and test launches for Red Squadron and I'm happy to report all of the flights went very well! 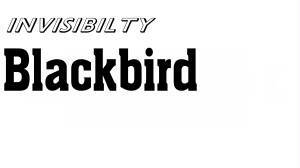 The Blackbird and both Mk II Vipers flew on a single B6-4 and were pretty fast off the pad. All flights were very stable and straight, had a nice coast phase, with deployments and recovery in excellent shape. 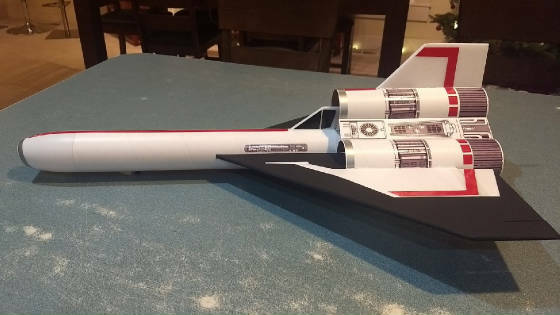 If you build one it will fly stock very nicely. 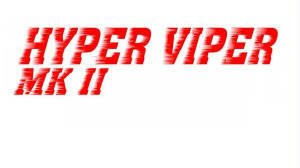 The Hyper Viper proved to be just that, hyper! The first flight was on a cluster of 3 A8-0's and a core B6-4. For the next flight we'll use 3 B6-0's, with a core B6-6. While we thought the HV would be pretty fast, we did not expect it to practically "warp" off the rod. The photos below, will give you some idea (but not really) of the difference in rod speed between the standard single B engine and the 3 A8 and 1 B6 engine cluster. Of the 5 different photographers and cameras trying to catch liftoff photos, I was the only one lucky enough to catch the blurred HV, just as it cleared the rod. I think I'll use 800 - 1000 asa next time. It left so fast I thought the paint job and decals might be in a clump at the base of the pad. And bear in mind, these were A8-0's and 1 B6, not even a full B cluster. As Kelly Bundy might say when thinking of flying it on a full C6 cluster, "it wobbles the mind." The flight was fantastic but ejection was just a bit early due to the 4 second delay. 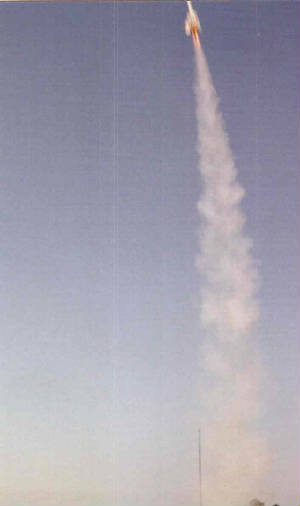 The bright red mylar chute was easily visible against the bright blue sky and the HV recovered nearby. 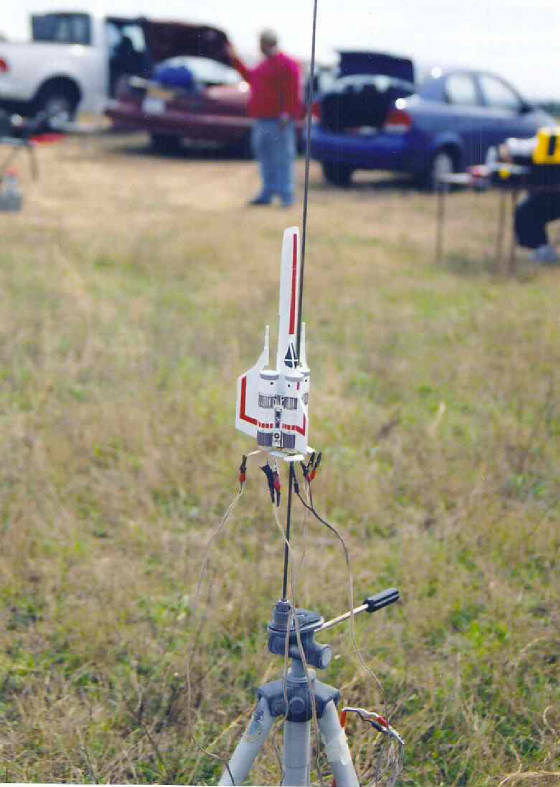 Evidently flight speed at ejection was too high. Even though I more than doubled the suggested length of shock cord, the 3.4 oz nose cone managed to take out the tail when it snapped back. It was a nice clean break, leaving only about 1/16th of an inch to remove before installing a new tail. The rest of the HV recovered in great shape and the tail was easily and quickly replaced. Even though I used enough weight to balance it for a 4 C engine cluster, I'll have to think about that one. We'd probably need to back up about 50 yards or so to get a photo, or be very lucky! **More good news was that the combination of vents and fire proofing methods used to prevent the burn through of the boosters on the engine tube enclosures worked very well. We were a little concerned that the small chamber created between the end of the engine mounts and the heavy paper disks that are used to close the bt off, might not be able to handle the pressure or the fire, but not even the exterior paint of the disks was discolored. There was a little burn through residue around the vent holes but it was easily wiped away. 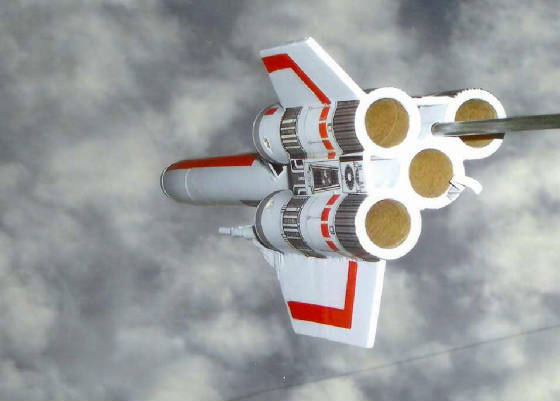 We used a similar method on Bad Girl, of coating the leading edges of the stuffer tubes with ca, where the stuffer tubes were almost in direct contact with upper stage engine nozzles. In that case, the stages fell away quickly and the exposure to flames was only for a split second. On the Hyper Viper, the small chamber had to do several things. 1. Vent the gas. 2. Handle the heat. 3. Retain the motors without burning through the enclosures. We'll see if there's any difference in handling the hot gases when we go to a full B6 set up. Check Out These Members of Red Squadron! Below: An original member of Red Squadron Bill "Boomer" Cooke's Viper is one of the best you'll see anywhere. 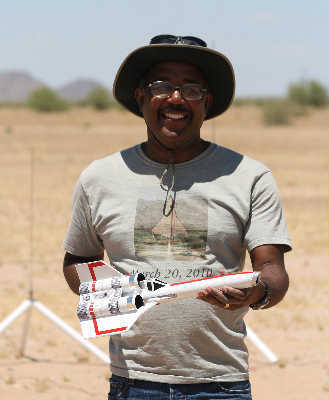 Bill has 2 great sites: Bill's Rocket Blog http://billcooke.org/rocketblog/ and Bill's Virtual Space: http://www.billcooke.org/ Both sites are well worth the trip. 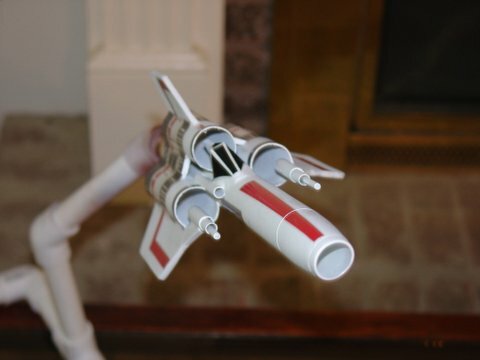 Below: Blake "Bo-Jay" Driskill adds another excellent Viper to Red Squadron. 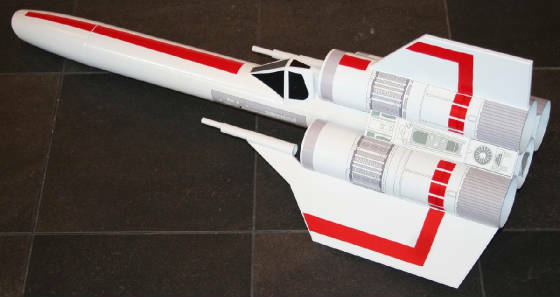 Jim Neubauer joins Red Squadron with his 4" 1/15th upscale Viper. Powered by a Pro 38 I345 White Thunder this one should make some Fire & Smoke of it's own. If you look closely on the right side bottom, you'll also see Jim's Estes version of the Viper. 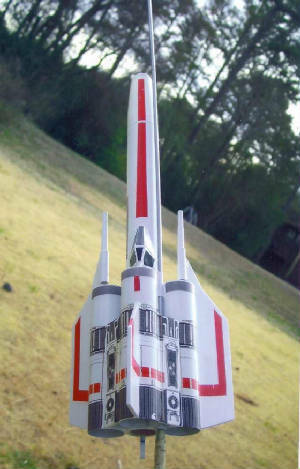 Above & below is Red Squadron member Jonathan Dunbar with his excellent BSG Viper 1:18 upscale. John Boren's 2.76 upscale Viper! The next 3 photos are of the Viper John flew at NSL 2017 on a 29mm motor. Great finish on this one! This one took first place at NSL 2017!